This banner is designed to remind us of the King of Kings and that His Kingdom exists wherever His rule is acknowledged. 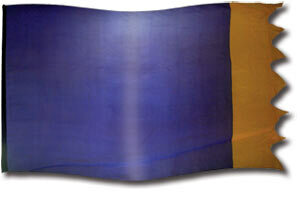 As the silk banner moves, out of the royal purple a golden crown is formed. Use it to declare "your Kingdom come..." and to celebrate His Kingdom in which we now live in, as well as His Kingdom which is to come! Wrap it around the shoulders of someone who needs reminding that they are a child and heir of the King and NOTHING can take that away from them! The Bible refers to the spiritual kingdom in Luke 17:21; John 3:5; 18:36; Romans 14:17 and 1 Corinthians 4:20; 15:50. And it is coming with power! (Daniel 2:44; Mark 9:1; Acts 2:2-4; Revelation 11:17; 12:10; and 19:6). Divinity, Kingdom, King of Kings, Majesty, Power, Royalty, The LORD King Forever.